Two posts in one day. That’s what I get to do when I have time on my hands. Today was my last day in Berlin, and it was chilly and damp with occasional drizzle. While the weather has been not been all that great during my stay, it has never been bad enough to prevent me from getting out. (The Thursday night forecast was for 4-6″ of snow, and we got nothing. It’s good to know the forecasters here are just as prescient as their American counterparts.) But it was a day for hot chocolate and warm food and good company. I spent most of the day in the company of fellow chorister P. and his wife S. We met at the Brandenberger Tor, which has quite a storied history that you can read up about elsewhere. What was most interesting to me is that it has served as a symbol for just about everything – resistance to French occupation in the Napoleonic wars, the power of Prussian might in the 19th century, the devotion of the Volk to Hitler, the freedom of the democracies against Communism, and finally reunification. At the end of the day, it’s just an old city gate. We did the short walk to the Holocaust Memorial. Unfortunately the exhibition was closed on Mondays, so we only saw the memorial itself. I’m not sure I cared for it. It felt dehumanizing. Maybe that was the point, but it didn’t move me particularly. We started afterwards towards Checkpoint Charlie and the Jewish Museum, but did a detour to look at the Topography of Terror exhibition. It proved to be quite interesting and very chilling. The exhibition basically presents the narrative of the organization of the Nazi terror apparatus from its beginning shortly after Hitler came to power to its zenith during World War II to its eventual destruction along with the Nazi state. Of all the documents on display, the one that struck me the most was a simple typed list of each country in Europe (including unoccupied countries like the UK and Finland) with a rough estimate of how many Jews were in each. This plain piece of paper contained the blueprint for the destruction of 11 million people. The other thing that struck me was the sheer banality of the apparatus and the enormous amount of paperwork that was produced. There had to be a lot of people sitting down in front of a lot of typewriters typing all this horrible stuff up. Who were they, and what were they thinking? Were they junior members of the security service working behind a desk, or were they civilian secretaries? Were they excited about what they were describing, or was this just a job and their minds were on what they were going to make for dinner or where they would spend the weekend with their boyfriends? More questions that will never be answered. We eventually made our way for a quick stop at Checkpoint Charlie and then on to the Jewish Museum. I’ve heard different opinions about the architecture and the exhibit, some positive and some negative, so I’ll give you mine. I didn’t like the way the museum was designed – it was too easy to miss portions of the exhibition and physically exhausting to walk through (maybe that was the point). But I thought the exhibits themselves were for the most part very interesting and informative. I saw the lute that my former Rabbi used to entertain at the Jewish rest home in Lehnitz. I also found something about Lewandowski (but only because I heard music while walking by – it was tucked away). I could have used more time there, but I was museumed out, and it was time to get some dinner and wrap things up. Speaking of wrapping things up, this will be my last post. I will try to add some more links and maybe some photos at some point in the future, but I wanted to cover the time from preparing for the tour to its end, and I’ve accomplished that. I hope you’ve enjoyed reading about it as much as I have writing the blog. About Berlin: I wasn’t sure quite what to expect, but I enjoyed the city. There is certainly a lot for the visitor to do, and everyone I met was gracious and accommodating. I think Berlin is still in the process of establishing its new identity. Given what it’s been through in the last 70 years or so, that will take time. I’d like to come back at another time of year, maybe late spring or early autumn, and do some more exploring. But for me the place is also full of ghosts. I can hear goosesteps echoing off cobblestone streets, and I can the screams of the crowd as their savior drives by in an open touring car, and I can hear the wailing of all those people, and not just Jews, who were the victims of that awful time. It’s not that it got in the way of my interactions with people or that it prevented me from doing what I wanted to do or enjoying myself. It’s just there. Zamir bistu sheyn, please let me explain, Zamir bistu sheyn means you’re grand. Auf wiedersehen! Zamru achim zamru! After breakfast this morning I wandered over to the entrance of the Hotel (Crowne Plaza by the way; highly recommended) to say goodbye to my friends and fellow choristers who were getting on the bus to return to Boston. I’m staying on an extra day. Even though I knew they were leaving, it was a bit of shock to realize that our Berlin adventure had drawn so quickly to a close. Yesterday was the last official day of the Festival. It began with a series of lectures by leading experts in Lewandowski, Jewish music in general, and other musically-related areas. My roomate M. (I will call him that in a nod to one of my favorite European Jewish authors, Franz Kafka) and I were planning to go, but we missed the bus. We got directions to the institute where the lectures were being held, but we didn’t know exactly where to go, so after several fruitless searches and conversations with befuddled guards, we gave up and headed for the Gemäldegalerie, which has one of the finest collections of 13th-18th century art in Europe. We didn’t have a lot of time, but we did see some spectacular art, including Rembrandt’s painting of Moses destroying the tablets, where the Hebrew was quite clearly portrayed on the stones. Returning to the hotel, we changed and headed out to the Rykestrasse Synagogue for our final concert, a joint concert with the other choirs participating in the Festival. This was our first opportunity to hear the other ensembles, so I was quite looking forward to the event. The Rykestrasse Synagogue is the largest in Germany, with a capacity of about 2000. You wouldn’t know that from the rather unprepossessing entrance that faces the street, but it is quite spectacular and very beautiful. Built in 1903/1904, it was vandalized during Kristallnacht but not completely destroyed, and services were conducted there until 1940 when the property was confiscated. As one of the few synagogues in the east still usable after the war, it became the center of Jewish life in East Berlin and has been restored over the years. The inside is quite magnificent. After a series of rehearsals punctuated by breaks for us to run out for coffee and Gebäck, we assumed our places for the concert. I would guess around 1000 people were in the audience; maybe more. The format of the program was an opening number (Ma Tovu) by the combined choirs, followed by a short, 2-song performance by each choir, concluding with another number (Adon Olom) by the entire group of singers. I’m not a big fan of massed choirs, and generally all you can do is either sing loud or sing soft and try not to wreck your voice, because you really can’t hear yourself. I don’t know how well we sounded, but we certainly sang loud (and to be fair, soft). It was very enjoyable listening to the other choirs; there were some very wonderful performances and some spectacular solos. We were 4th and closed out the first set. IMHO, Josh did a great job in his selection of pieces: we were the only choir to sing one of Lewandowski’s German numbers, which was an important element of his body of work, and the focus of the pieces was on the choral elements as opposed to solos (although the German piece, Ewiger, an den Himmel reicht deine Huld (Psalm 36) did include a wonderful solo by Joel Kaplan). The first piece we performed was Enosh (from Psalm 103), which I referenced in a previous post and provided a link. As I mentioned, it’s associated with mourning and is very evocative of the mix of sorrow and faith that many feel when affected by a personal tragedy. It starts with a long, meditative organ solo (performed by our extraordinarily talented accompaniest, Ed Swanborn). At this point in the piece we were asked to bow our heads as a bit of choreography. Now I tend to regard this kind of thing as gimmicky, but I go along and act the part. This time, though, something strange happened – I immediately felt chills running up and down my spine, and they wouldn’t stop. I’m not sure what it was – maybe I was getting sick (but I feel fine today), or maybe it just hit me what happened in this place. It was the same feeling I’d had the other day when I visited the deportation center. I think it affected us all, because I’m not sure we ever sang that piece any better than we did that afternoon. 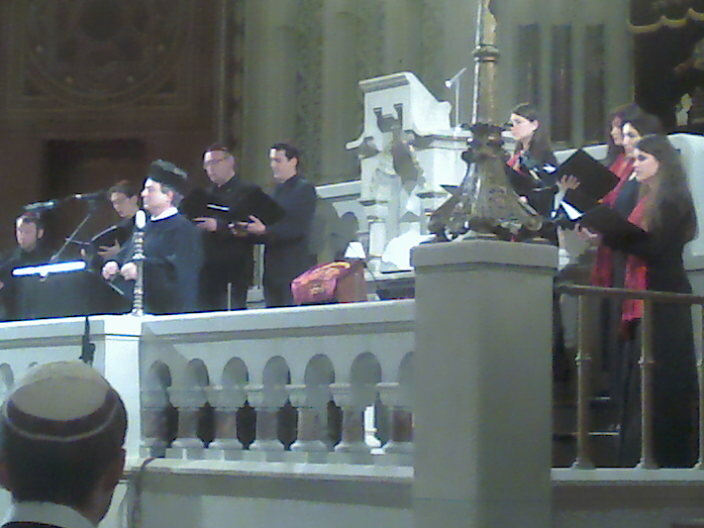 (One of the choristers from another choir commented that we sounded like one voice, which is a great compliment.) I think the response we got from audience confirmed that feeling. 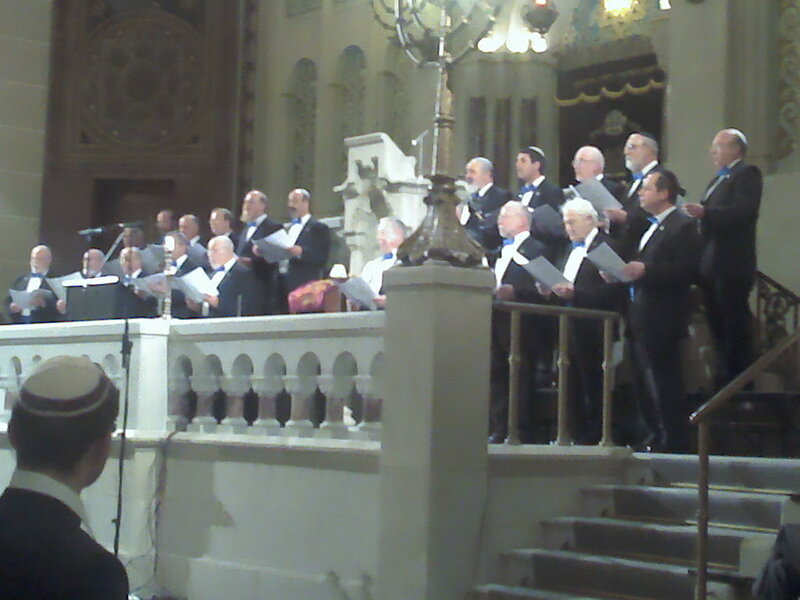 We also sang Psalm 36 with (I thought) great clarity and fidelity to the music (although someone else I spoke with later asked why we did a Yiddish piece – sigh). We got a fine round of applause as we took our bow and left the stage. (Insider piece of information: we do practice our bows from time to time, and so that we are co-ordinated we quietly count to 5. It seems to have become a tradition to count in the language of the country we’re in, so yesterday it was eins-zwei-drei-vier-fünf). Time to stop writing and be a tourist. A lot to report but not a lot of time. I will have to do some catching up later. It’s been a very busy couple of days. 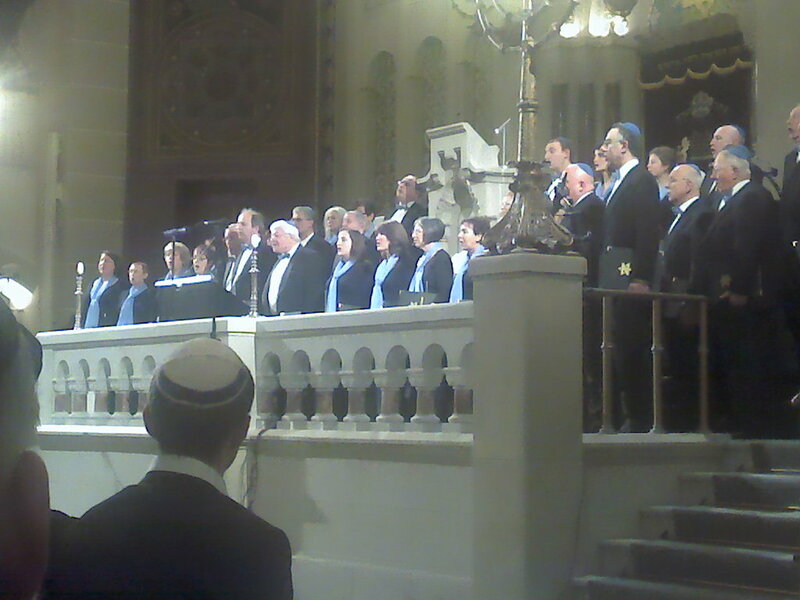 Yesterday we went to the Pestalozzistrasse Synagogue for the official opening of the Lewandoswki festival. It is a beautiful building on the inside, rebuilt from its destruction during Kristallnacht in 1938. The Synagogue also has the distinction of being home to the Synagogal Ensemble Berlin, who perform a service incorporating Lewandowki’s music every Shabbat. The ceremony began with performances by the Ensemble alternating between speeches by Festival organizers and local dignitaries. 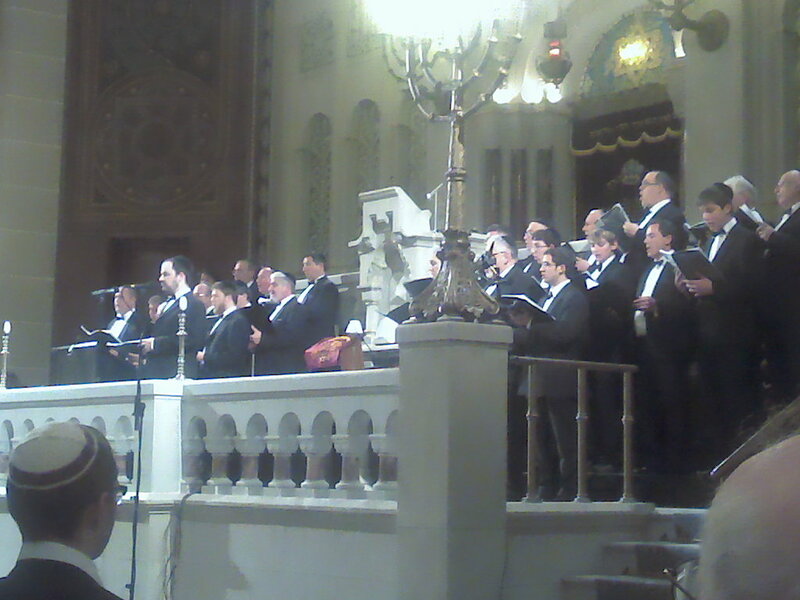 The Synagogue acoustics were excellent, and the choir made a wonderful sound. I was particularly impressed with their attention to dynamics and their ability to sing loudly without shouting (not as easy to do as you’d think). Following the opening ceremony, we went right into the Friday evening service. Although much of the service used Lewandowski’s music at appopriate points in the liturgy, there were opportunities to sing more traditional melodies at certain points. I always find it remarkable that it’s possible to walk into a synagogue in different parts of the world and, assuming you have a basic idea of the service structure and text, it’s possible to feel very comfortable with the service. After the service we returned to the hotel for Shabbat dinner, where we encountered the first real planning problem. There were more people attending dinner than there was seating. A number of Zamirniks wound up standing around a large table where we stood shoulder-to-shoulder and did the best we could. It actually turned out to be a lot of fun “roughing” it, and the generous amount of wine available probably made things a little more tolerable. After dinner some of the other choirs starting singing, and not to be outdone, we broke out in a niggun-style (no words, just “dai-dai dai-dai-dai” or something similar) version of a Shlomo Carlebach song, along with some of dancing while we sang (not as easy to do as you’d think, especially on an empty stomach). This morning we scattered. 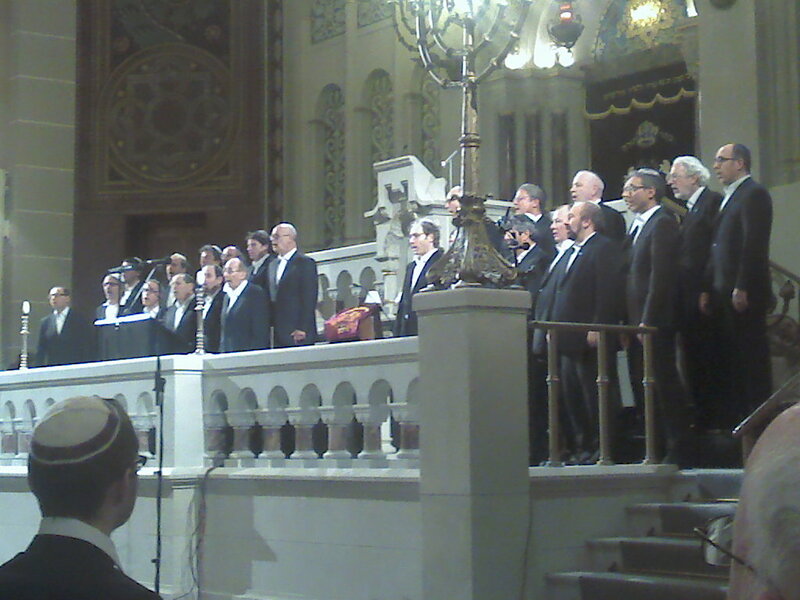 Some people when back to synagogue, others spent their Shabbat day in more secular pursuits. I went along with some other chorale members to investigate the Prenzlauer Berg area in the former eastern zone, a section of Berlin that largely escaped bombing during the war so still contained much of the traditional 19th century architecture. It had the familiar feel of a run-down area of a city that had been gentrified – a bustling street market, a nice park, lots of small shops and restaurants, young families pushing baby carriages, and older couples walking arm-in-arm carrying the day’s shopping. After an excellent meal at local cafe, we headed up the street to catch a streetcar (Berlin has an excellent public transportation system, even by European standards – quick, cheap, and reliable – that puts we Americans to shame) to an area that still had remnants of the original wall and No-Mans-Land. Even thought most everything is pretty much gone, it still presents a stark reminder of what this area was like when it was the focal point of the Cold War. From there we went to Oranienburg Strasse to see the Oranienburg Synagogue that was Lewandowski’s home synagogue. You can read up about it, but it survived Kristallnacht but did not survive the war, when it was accidentally bombed by the RAF (I understand the pilot was a German Jewish refugee who had joined the RAF). It has been partially restored, but it was not open as it was Saturday. A few blocks away was the location of the central collection point where Berlin Jews were rounded up and deported. There’s a very moving black that explains how 55,000 Berlin Jews, from the very young to the very old, were deported and brutally murdered. There was also a very simple sculpture where it was possible to place memorial stones and say a prayer. It is so hard to walk in these places and not hear echoes of the terror and anxiety these poor people felt. After the concert we boarded buses ostensibly to head back to the hotel. We had been informed that there was a surprise in store for us, but we didn’t know what it was. When the bus came to a half, we weren’t at our hotel, but were instead were deposited by the TV tower that we had seen earlier in the day (remember the Death Star?). We took the elevator up to the revolving restaurant some 300 meters up, where we had a terrific view of the city lights and had dinner. It was a fun way to end a very busy day. I write this sitting in my hotel room in Berlin, having started my day (days) on Wednesday evening from Boston and ending it here, following a reception welcoming the choral groups participating in the festival. It has been needless to say a very long day. I didn’t travel with the group, so you’ll need to read some of the other blogs to find out what happened. All I know is that the main group arrived uneventfully this morning, with stragglers like myself checking in at various times in the day. I flew here via London and arrived in Berlin about 1 p.m. It was necessary for me to get to the hotel on my own, and I was able (without speaking a lick of English) to find out which bus to take and then (with the help of my handy GPS) walk to the hotel. After that it was get ready quickly for our first concert, which took place early this evening at the Krankenhauskirche im Wuhlgarten. After a longer-than-expected bus ride, we arrived at the church and began rehearsing. The church itself is relatively new (it was built in the early 1900’s), but it was built in the Romanesque style so it feels older. The acoustics were terrific. During rehearsal, it was clear that the long day of travel had taken its toll, and we had challenges with intonation, consistency, and focus. Our hosts had very graciously laid out a very nice spread, so getting some fuel was very helpful. And then as we were rehearsing people started wandering in. 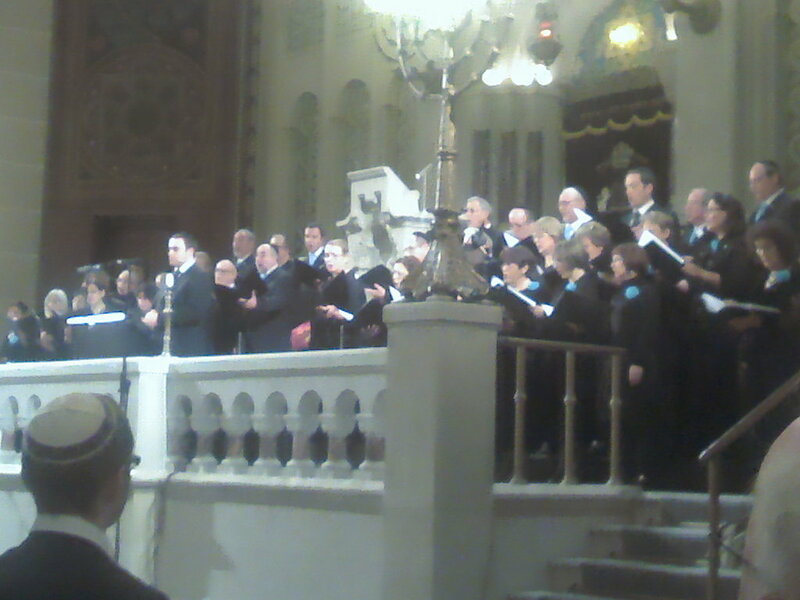 I had wondered what kind of an audience we would get for a Jewish choir singing in a church in a Berlin suburb on a Thursday night. As it turned out I needn’t have worried. We drew a very nice crowd (I would guess around 150-200 people). I don’t know if it was the food, or the large crowd, or our collective determination to put on a good performance, or all of the above, but the performance turned out to be very solid, and we had a wonderful response from the audience. After the concert, we were all handed roses and had a chance to talk with members of the audience, who universally expressed their good feelings about the performance and about us having come from such a long way to perform. A converation I had with one gentleman was particularly interesting. We were discussing the quality of the acoustics and how the church was a great performance space and what a pleasure it was to sing there. He said something to the effect that it was an important event, because it helped emphasize what they (i.e.,, Germany) had lost by pushing out its Jews. I was very touched by that sentiment. We then returned to our hotel, where we immediatly went to a kickoff reception for the festival, which featured some very tasty eats and the answer to my prayer (beer was served). Because it was such a hectic day and I spent what little time I had in Berlin getting to and from the concert, I really can’t offer much in the way of first impressions. I will try to post another entry tomorrow before Shabbat. We will be going on a tour of Jewish Berlin tomorrow morning, so it should be an interesting day. It’s inevitable that any Jew of a certain age travelling to Germany for the first time will need to confront the question of their relationship to Germany and the Holocaust. For some, this is mostly an abstraction: their families emigrated from Europe generations ago, and this is a subject taught at religious school or observed on Yom HaShoah. For others, the impact is more visceral: their immediate families were affected, and the stories passed down from the generation who went through the horrors of that time to the next are very, very personal. I fall into the latter camp. As I mentioned in a previous post, I am of Austrian background. Both my parents grew up in Vienna. My father was part of a very assimilated family living a comfortable middle class existence. He was an accomplished pianist and had ambitions to become a professional jazz musician. My mother grew up in a poor Orthodox family. She rebelled at an early age and became a devotee of European intellectual thought (her idol was Goethe) and an habitue of the night club scene. That’s where they met. They were married on June 14, 1938 (3 months after the Anschluss) at a ceremony at the main synagogue in Vienna. Two months later they were able to leave the country and emigrate to England, eventually coming to the United States in 1940. Most of my father’s family got out; most of my mother’s (including her parents) did not. I grew up being very aware of my parents’ experience (and the experience of other survivors who were scattered from New York to Melbourne, Australia, and of one of my father’s cousins who survived Auschwitz), and the impact of the Holocaust on my family has colored my view of a lot of things. A few years ago I had the opportunity to spend a few days in Vienna. 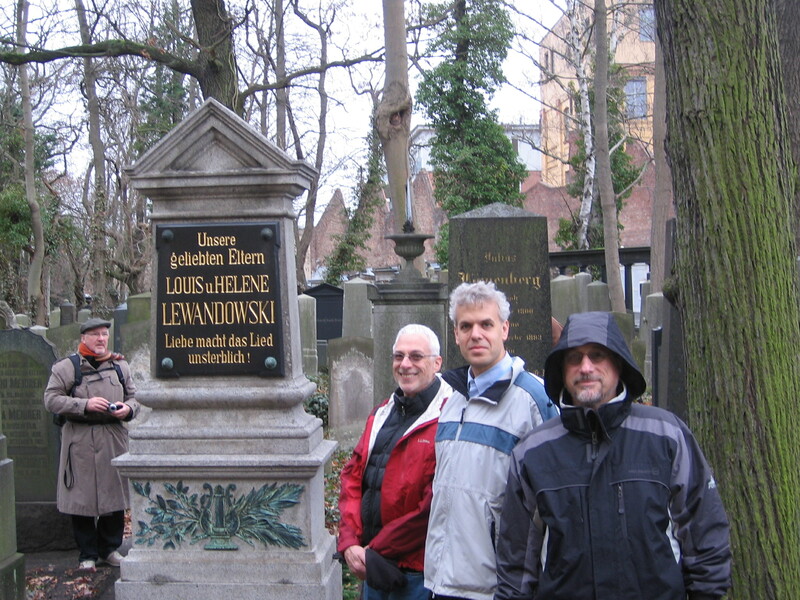 I did the family thing (including saying Kaddish over the grave of my grandfather Adolf (!) who died in 1935, looking at my family records at the Israelische Kultusgemeinde, and visiting the last known address of my grandparents before they were deported) and the tourist thing (the musicians’ section at the ZentralFriedhof where Beethoven, Schubert, Brahms, and J. Strauss are buried within a few feet of each other, wonderful art museums, and the odd palace). I spent the last evening at a traditional Vienna cafe looked after by solicitous waiters in formal white with black aprons, and as I was sipping my coffee after a fine meal, it occurred to me that my parents may very well have done the same thing long ago. It also occurred to me that at some point there might have been a sign on the door that my kind was not welcome. I don’t have any direct connection with Berlin, but I do have an indirect one. The Rabbi of the synagogue I attended when growing up (Temple Beth El in Poughkeepsie, NY), Rabbi Erwin Zimet, came from Berlin. I was friends with his son Jonathan (now also a Rabbi), and I got to know him as a “civilian”. When I learned of our trip to Berlin, I contacted Jonathan, and he and his mother (who led the Synagogue choir and brought Lewandowski to Poughkeepsie many years ago) provided me with some wonderful details about Rabbi Zimet’s time in Berlin, where among other things he was a student Rabbi at the Oranienburgstrasse Synagogue where Lewandowski practiced his craft. There is also a collection of items related to Rabbi Zimet at the Jewish Museum in Berlin, and several are on exhibition, include a lute! One our concerts will be at the Jewish Museum, so I hope I’ll have a chance to find his artifacts. It’s funny how things come around full circle. So where does all this leave me? I think I’ll be ok. Just about everyone who perpetrated the atrocities of the past is dead or almost dead, and it’s not right to visit the sins of the fathers on the next generation. I get the impression from what I’ve read and what I’ve seen that the German government and people have worked hard to pass along the lessons of the past to ensure the climate of hatred is not repeated in the future. And the festival itself, paying tribute to not just a noted German composer but a noted Jewish composer, is testimony that the Jewish community is reestablishing itself as a respected part of German society. I’m quite looking forward to seeing the new post-Cold War Berlin. One of the things I like about singing with Zamir is that we are a repertory choir, so we perform from a large and varied body of music, ranging from Israeli folk songs, jazz numbers, and showtunes all the way to “serious” classical works from Renaissance to contemporary. As a performer, it never gets boring, and there’s usually something that’s particularly appealing or something new to sing. Music of Lewandowski and his contemporaries: Lewandowski’s music is very much in the mainstream of mid- to late-19th century classical music. His music could very easily be mistaken for Mendelssohn or Brahms, although the Hebrew is kind of a giveaway (he also wrote music using German subtext). What I like about Lewandowski is the emotional directness of his compositions, which allows the performer (and the audience) to really feel that emotional intensity in a very personal way. Listen to the music for which I’ve provided links. Without knowing that the text of Enosh is taken from Psalm 103, often associated with funerals, you can feel the sense of sadness mixed with faith that sustains so many in times of personal tragedy. Or listen to Lewandowski’s version of Psalm 150 (Halleluyoh), and without knowing the text you can feel the pure sense of almost anthemic celebration in praise of God (tell me you don’t want to yell “Play Ball” at the end of it). While his music can be sometimes a bit over the top, it’s always challenging and fun to sing, and as a performer you can’t ask for much more. We’ll also be performing a work by Mendelssohn. Music of 20th-century German Jewish refugees: The Nazi takeover of Germany resulted in a diaspora of German-Jewish artists, musicians, scientists, and intellectuals, and Germany’s loss was the rest of the world’s gain. A host of talented musicians and composers settled in the U.S. and other countries, and their contributions to the cultural life of their new homelands were significant. The Chorale will be bringing the music of these refugee composers back to their homeland, and we will be performing music of, among others, Kurt Weill (of Three Penny Opera fame), Friedrich Hollander (who wrote music for many famous films and was nominated for 4 Academy Awards), Herbert Fromm (who focused on music for the synagogue), and Heinrich Schalit (originally from Vienna). The Shalit piece we’re doing, a setting of V’Sham’ru, is particularly amazing. This is a prayer I’ve sung a million times in a melody that almost sounds like a folk song, very cheerful and sing-songy. Shalit’s interpretation is totally opposite – it somehow manages to tap into the mystical aspects of the text describing the creation of the world and the sense of absolute peace on the 7th day when “God ceased from work and was refreshed”. There’s a great explanation of the piece here, and you can also listen to it. Everything else: Ok, the rest of the repertoire could probably be further classified, but I’m running of out steam. We’ll also being doing a wide variety of music ranging from Hanukkah-themed music (excerpts from Handel’s Judas Maccabeaus auf Deutsch no less, an 18th-century setting of Maoz Tsur from the Ashkenazi community in Venice, a rambunctious setting of a Ladino song Ocho Kandelikas) to a jazz setting of Adon Olam to music of the “hippie” Rabbi Shlomo Carlebach. And yes, there will be showtunes, because everyone loves showtunes. On a more prosaic note, I’ve added some additional links to the other choirs participating in the Festival. I’m particularly looking forward to meeting and performing with my fellow musicians. I hate memorizing music. There, I’ve said it. I understand all the reasons why singing off-book enhances the experience of both performer and audience (note I wrote “understand”, not “agree”), and I realize that sometimes it really is better to be free from holding a folder, but I find it an unwelcome and distracting chore. Actually, it’s not so much the music (which I can remember relatively easily) as it is the lyrics (which in this case are in German, Hebrew, and Yiddish). My brain is not wired for good short term memory (what did I have for breakfast again? ), and sometimes the words just don’t stick even after frequent study. But I’ve been asked to do it, so I will try my best. I recognize that to sing in an ensemble means sublimating ones own selfish desires for the greater good of the group (or as Mr. Spock put it, “the needs of the many outweigh the needs of the few”). Does that mean Republicans don’t make good choir members? BTW, I’m not the only one keeping a blog of the tour, so I’ve added links to the other bloggers. Check ’em out! As we are going soon to Germany, I was thinking about the German origin of so many Jewish surnames. I have one myself – Lustig. While my background is Austrian, both the Austrian empire and the many German states in the late 18th and early 19th centuries followed a similar policy of requiring Jews to adopt surnames in an effort to assimilate them into civil society. As I understand it, if you had money or influence you could obtain a more “attractive” name, but if you didn’t, you took what you were given. That would suggest that my forbears were either poor or unbearably cheerful. I found this to be a particularly interesting article about German-Jewish surnames. Update from yesterday’s post. We received an updated program of our tour, and we will in fact be attending Friday evening services at the Pestalozzistraße Synagogue, so we will hopefully have the opportunity to experience Lewandowski’s music in its intended context. What struck me as I wandered around looking for examples is that Lewandowski’s music is presented as performance pieces, but that’s not how they were conceived. The synagogue music he wrote was, well, meant to be sung in the synagogue as part of a service. So the experience of both the performer and the listener is bound to be different. I know this because for the past few years I’ve co-directed an ensemble that uses the music of the 17th-century Italian Jewish composer Salamone Rossi Hebreo (the first known composer of choral music for the synagogue) in the liturgical context for which it was intended (as part of an Italian rite service), and it certainly is a different experience when the focus is on the service itself. 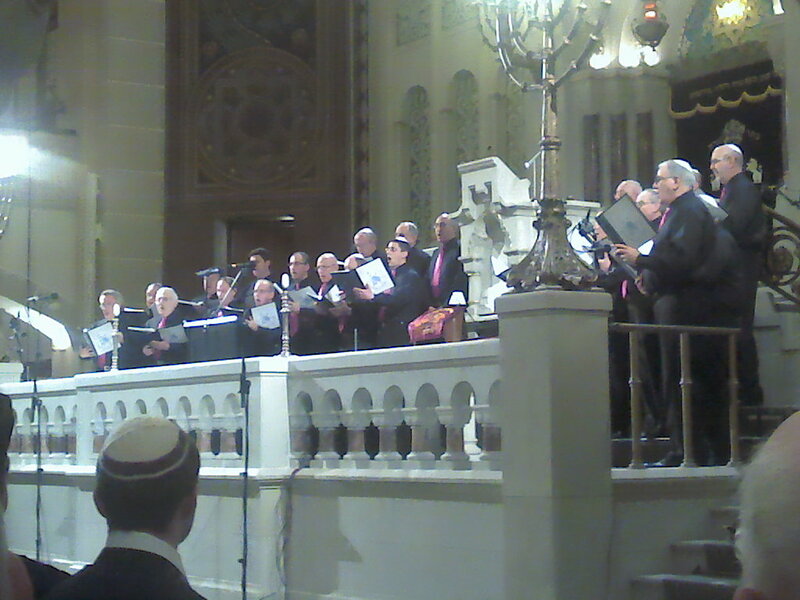 One of the choirs that is performing at the festival is the Synagogal Ensemble Berlin, and they have continued the tradition of performing Lewandowski’s music as part of regular religious services at the Pestalozzistrasse Synagogue. It would be interesting to attend one of their services while we’re there.